The software allows you to safely enjoy file sharing using just an USB thumb drive for copying the files . Movies, mp3s, documents and pictures can be copied from one computer to another without worrying of getting infected with worms and viruses trough USB drive. The interface is very clean and well organized so that one can access all functions with minimum effort. You can find more details about how USB Guardian protects your PC against worms and viruses on this page. It is possible to give a USB flash drive / USB memory stick a behaviour that is very similar to autostarting CD's and DVD's. This poses a huge security risk because you can, unintenionally run malicious software such as worms an viruses. This is where USB Guardian comes into rescue. The application is constantly scanning the USB port for a new removable storage device and this has led to a very small resource consumption when idle (which makes up to 99.5% from it's time). 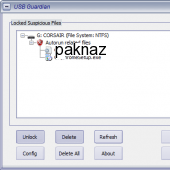 USB Guardian is able to identify which USB flash drive is inserted and it detects potentially dangerous files on the drive. Enjoy the full benefits of USB Guardian for FREE . Yes, That's right! We are releasing this software for free so you can protect your PC against any USB viruses.